Examining the branches, fruit/seeds or leaves of a tree can be very informative, but only if you know what you’re looking for. If, for example, your oak leaves look “bubbly,” you could be dealing with a disease in the tree itself or an external parasite using the leaves to burrow or lay eggs. The treatments for these are very dissimilar, which is why getting a professional diagnosis and treatment is important if the problem has gotten big enough to be visible in the leaves. As a tree weakens or produces chemicals or other defenses against attackers, it may attract a different crowd of flora, fauna and insects. Larvae of the Emerald Ash Borer attract woodpeckers, which are drawn to feast on the “easy prey” beneath the bark. 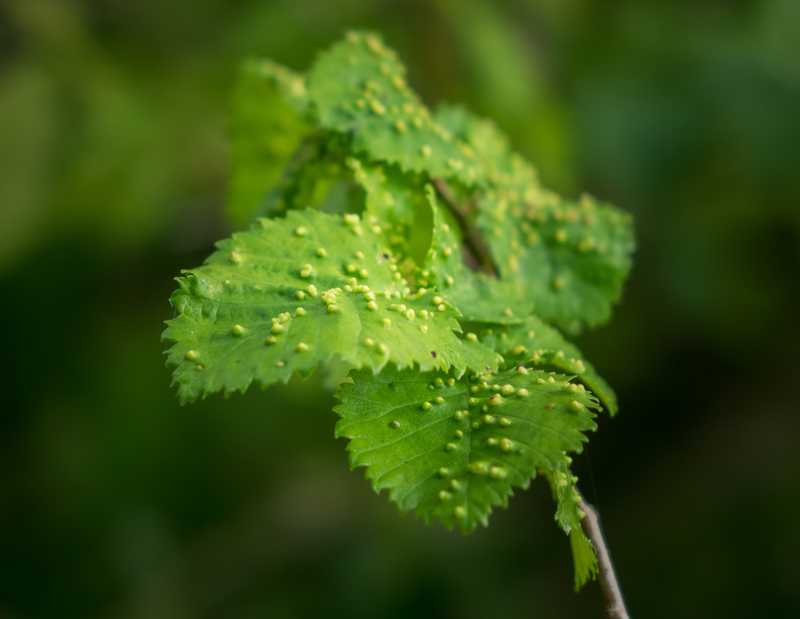 If you frequent the tree or trees that you suspect may be diseased, make a note of unusual insect or animal activity, especially near to visibly diseased areas. Pictures are a great start, but bagging a fresh specimen of an insect or fungal growth to show to a tree expert is even better. 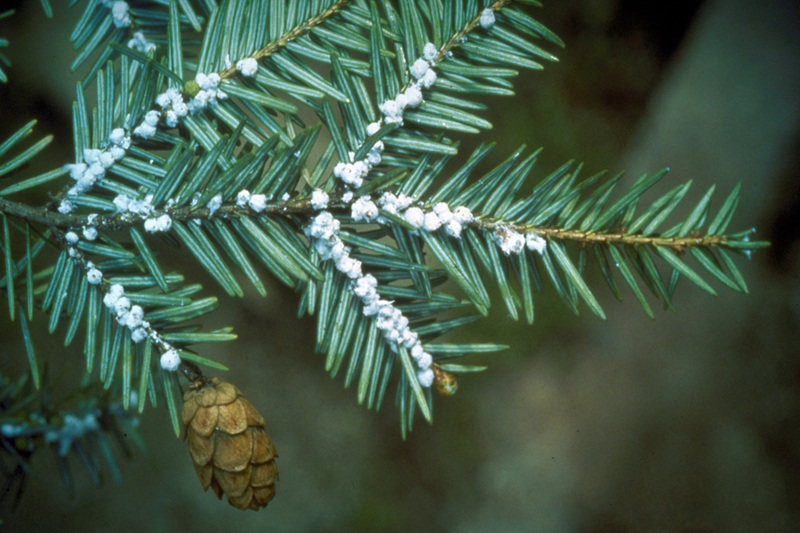 The Woolly Hemlock Adelgid is another distressingly familiar foe to hemlock trees across the country, with the most damaging effects found along the varietal hemlocks of the East Coast. Trees inflicted by this stubborn, sap-sucking pest can be spotted by the presence of clusters of white ovisacs, resembling frost, found along the inside of branches. These troublesome tenants can be sent scurrying with a soil injection or tree infusion, and the sooner the better if telltale signs are spotted. Image at top from Connecticut Agricultural Experiment Station Archive. If large bubbles of sap show on your pine tree trunks, chances are you have a very unwelcome tourist: the Mountain Pine Beetle. This small black beetle looks harmless and unassuming, but as its larvae encircle a tree trunk under the bark to cut off water and nutrients, their negative aspects become clear. Found throughout North America from Mexico to Canada, no region is safe from these invasive insects, which can take out a whole forest if left unchecked. More densely wooded areas are more vulnerable, as the beetles find the rich resource area hard to pass up. Removing them for good typically takes selective culling and burning by a professional service, and in smaller infestation cases, luring the beetles to a controlled area with female beetle pheromones for destruction. If a non-native vine, fungus or other parasite is choking a tree’s trunk or branches, the same “bag and tag” tack mentioned above can be useful. Certain native insects can be used to combat invaders, and targeted pesticides can eliminate or cripple encroaching plant-based interlopers. If the branches of the tree aren’t budding or start growing in an odd direction, the tree may have succumbed to a growth-inhibiting parasite or disease. When a tree’s trunk isn’t growing straight and there are no visible restrictions to upward growth, the next step is to test the tree for known growth-inhibiting diseases. Even if the growth problem is caused by severe weather conditions or lack of soil quality, an intervention with certain chemicals, infusions or other support can help course-correct and adjust the tree’s growth to where it should be. Whether a tree begins its life in a poor growth area or the environment around it becomes less supportive, physical restrictions, environmental quality and weather can all play a factor in inhibiting or encouraging tree growth. If you can’t alter the environment to be more hospitable, taking precautions such as staking to straighten growth and installing irrigation measures to combat drought also get the job done. If you aren’t sure where to start, an arborist or similar plant expert will be able to offer suggestions and tips for supporting your favorite individual trees and forests. Without trees, our continent and our world loses several important resources in one fell swoop. Learning to spot problems and seeking out solutions for rot, fungus, diseases and invasive insects is the first line of defense our country has against unintentional deforestation. Don’t wait until a trunk is crumbling in on itself or branches go dry and brittle before addressing a threat to the center of important ecosystems – your food, shelter and even the air you breathe is dependent on these majestic members of the forest. This article was submitted by Diane Rajkumar at Alberta Arborists. They are a tree service company serving Edmonton Alberta and surrounding areas. The professionally trained I.S.A. Certified Arborists are very experienced & dedicated in providing professional tree care with safety, professionalism and integrity. Take-a-way: Keep your eyes on your trees and check out changes on a regular basis. By nedtillman2 in Backyards, Forests, Guest Post on May 20, 2015 .